"Bike sharing schemes are an essential part of today’s mobility landscape. The three largest bike sharing schemes in Europe are used for trips equivalent to going around the world ten times each day (see below). OBIS research revealed that between 10% and 20% of bike sharing trips replace car or taxi trips in some schemes. Thus the schemes contribute to healthier, cleaner and more sustainable urban mobility. 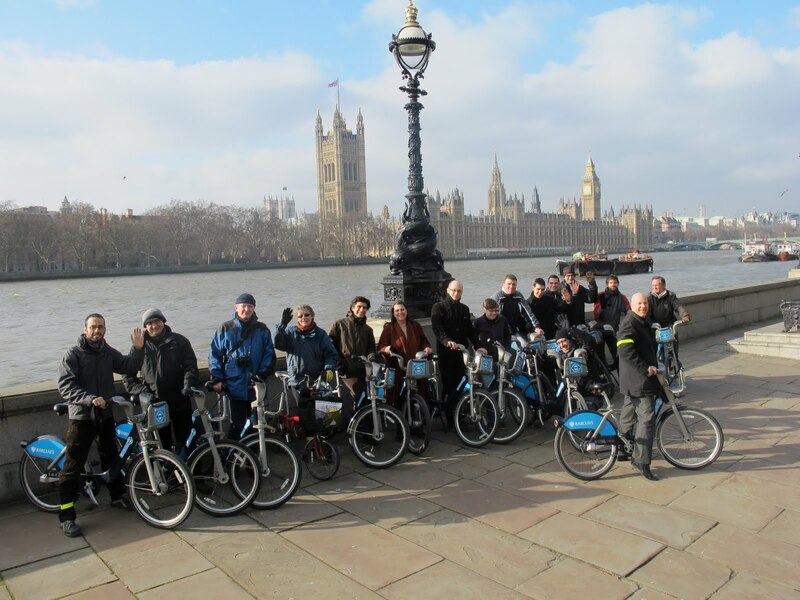 "The OBIS project team had a close look at more than 50 European bike sharing schemes during almost three years of project work. A complete handbook- the first of its kind-provides recommendations for authorities and practitioners. Recommendations cover the implementation and optimisations processes for bike sharing schemes from scratch. Technical solutions are presented and compared; different service designs are set into the context of city features (e.g. topography, climate, cycling culture) and optimisation approaches in terms of technology and service levels are described. "The project team will present the handbook at the final project conference in Prague on 21st June 2011. The handbook presentation will be accompanied by presentations of various schemes such as Barclays Cycle Hire (London), Bicing (Barcelona), BikeMi (Milan), Call a Bike (Berlin), City Bikes (Stockholm), Leihradl-nextbike (Austria) and CD Bike (Czech Republic). Interested stakeholders are invited to register until 31st March 2011. Participation is free of charge but seats are limited. More information can be found on www.obisproject.com." With The Bike-sharing World Map's 1,000,000th page view within reach, its popularity has far exceeded our expectations. When I founded The Bike-sharing Blog in May 2007, it quickly became evident that The Blog needed a companion graphic to track the growth of the field in a complementary way. So in October 2007, I launched The Bike-sharing World Map to compile all the cities planning and launching a service that I wrote about in the Blog. Not too long after the Map was created, this companion piece took over as the more often viewed site and the Blog actually became the companion to the Map! Russell Meddin joined me in 2008 and assists in keeping the Blog and the Map up-to-date in the rapidly changing world of bike-sharing where new services seemingly launch every week. We thank our readers for supporting both The Bike-sharing World Map and The Bike-sharing Blog and look forward to the next million views and all the new services that will come on-line during that time. Today in Miami Beach, Florida, an experiment in bike-sharing begins. DecoBike starts its operation in what is considered the crossroads of North and South America. A city of almost 90,000 people will have 1,000 DecoBikes in 100 DecoStations making it the service with the best ratio of bikes to population in the Americas. DecoBikes takes its name as a nod to the Art Deco buildings along the beach. The service is not part of a street furniture contract, nor is it run by a non-profit that oversees operations for the city, nor it is a public-private scheme, nor is it a publicly owned and funded system. It will be one of the few services set up totally as a private venture as it is run as a concession within the city. In fact, as a private venture, the company already has all of the DecoBikes sponsored by KLM-Air France to publicize its upcoming new air service from Miami to the world bicycle capital, Amsterdam! With a concentration of stations, the service is made to work for both residents of Miami Beach and the many tourists that seek its Art Deco hotels and warm beaches. The pricing for using the service differs from most other bike-sharing programs. For residents, the longest term for a membership is monthly at $15. There is no yearly membership. For both residents and tourists, there is a daily access pass for $14, a 3-day access pass for $30 and a special 5-day access pass for $49. All of these passes allow unlimited trips during the term with each trip 30 minutes or less at no charge. Each additional 30 minutes is billed at $4. The stations not only allow sign-ups for access passes, but also allow the borrowing of a DecoBike on an hourly basis. The hourly rate is thirty minutes for $4, sixty minutes for $5 and 120 minutes for $10, in each case, it is a single use. Most of these options are available at the easy-to-use stations. Now with bike-sharing in sunny Florida, those bike-sharers whose services hibernate for the winter will have a place to enjoy the beach and the bikes. StadtRad in Hamburg, Germany adds better functionality to its bike-sharing system making it easier to pick up and return a bike. In this bike-sharing era, there is much talk about smart mobile phones accessing new P2P (peer to peer) and social bike systems where no stations are necessary (i.e. "flexible" systems). In Germany where Call-a-Bike and nextbike have been mostly accessed by mobile phone, the newer systems such as StadtRad in Hamburg and Berlin have now added walk up kiosks as well. Beginning the first of this month in Hamburg, an RFID (radio frequency ID) membership card can be tapped on a bike's lock to release it. Tap the lock again with your RFID card when the bike is returned to lock the bike at any of the stations. Also, in Mainz, Germany, a system of 1,000 bikes in 120 stations, similar to StadtRad Hamburg, is currently under construction. Nuremberg, Germany also starts a new RFID card system in two months. NorisBike will have 750 bikes throughout 65 stations. As attractive as smart phone based bike-sharing seems, the country that has used telephone bike-sharing for years is now moving to incorporate card-based kiosk stations to better serve its cities. Our friend Mike Rubo of the Sit-up cycles blog has made a new film with inciteful interviews from Barcelona's Bicing system. It explains how this system should be used as a model to improve bike-sharing in his native Australia. The Ides of March will grab lots of eyes as the sexiest bike-sharing system, DecoBikes, starts in Miami Beach Florida. Grab you bathing suit and take a ride on South Beach and enjoy the scenery! Bike-sharing to return to Ottawa- Gatineau, Canada this May after a one year hiatus. The National Capital Commission (NCC) has approved a Capital bIXI system with 10 stations and 100 bikes for Canada's seat of government. 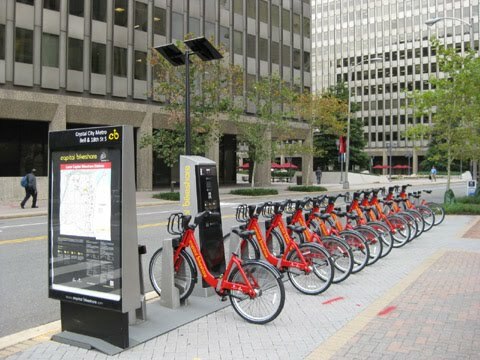 NCC hopes to increase the size of the system to 500 bikes and 50 stations. Capital bIXI and Toronto bIXI will join Montréal bIXI in Canadian bike-sharing this year. Crain Business News is reporting that Alta Bicycle Share and Trek B-cycle as finalist in the running for the New York City Bike-sharing contract for a system to begin late this fall or early next year. 1) Be a bike-friendly community first. Your community should be bike-friendly first with a dense network of bike facilities, such as cycle tracks, bike lanes, and trails. This network of bike facilities will enable bicycle riders and your future bike-sharing customers to easily and safely travel through your community by bike. 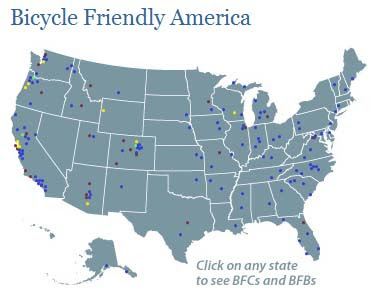 The League of American Bicyclists’ Bicycle Friendly America Yearbook offers examples of what other communities have done to become bike-friendly. Many communities with bike-sharing services also have high Bicycle Friendly Community ratings and include: Arlington, VA, Washington, DC, Minneapolis, and Denver. As you implement a bike-sharing service, your community should strive to be at least a bronze-level Bicycle Friendly Community. 2) Bike-sharing is not cheap, so secure sufficient funding. By implementing a bike-sharing service, you’re launching a new transit service. It may be less expensive to purchase and operate than a bus or rail service, but sufficient funding is required to make it successful. While the types of bike-sharing systems vary, costs can be up to $5,000 per bike for capital and operating expenses can range from $100 - $200 per bike per month. A service with a couple hundred or thousand bikes is pricey. However, while implementing a service is not cheap, bike-sharing can be a cost-effective public transport option. 3) Size and density matter. A bus service with a solitary bus or just a couple of stops will only be accessible by a limited number of people—those living, working, or playing near the stops. The same can be said for bike-sharing, as the greater the number of bikes and the wider the network of stations translates into a more successful service. Station density should be such that a customer can find a station every couple of blocks. 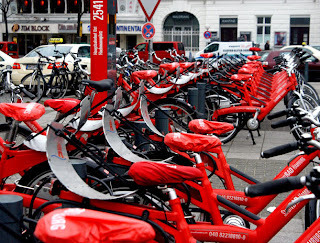 In fact, a bike-sharing service’s usefulness will increase geometrically with each additional station as each station expands the reach of your service by better connecting places into this new transit system. 4) Get private sector sponsors. 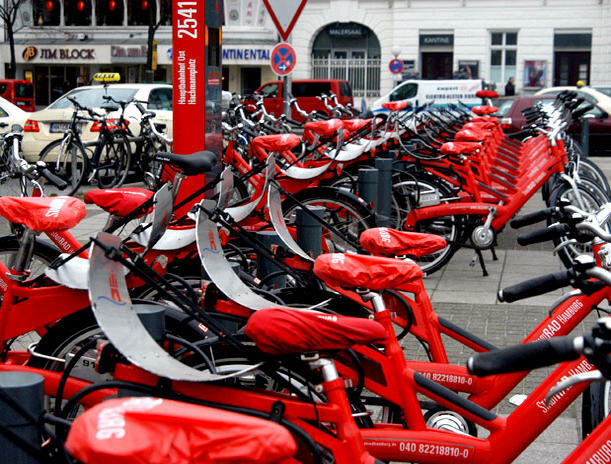 Bike-sharing lends itself to public-private partnerships. Private organizations can assist the implementing agency by sponsoring the service or purchasing a station for outside of their worksite. They also find bike-sharing good for providing their employees a healthy commuting option, making their location more accessible to customers, being environmentally healthy, and promoting a green service. The public benefits by having some of the costs of buying and operating a service covered by private organizations. Whether the implementing agency is a local government or non-profit, both have successfully taken advantage of sponsorship to help expand their service’s reach. 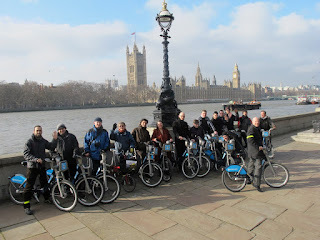 Barclays Bank sponsored Barclays Cycle Hire in London to the tune of $40M. BlueCross BlueShield of Minnesota sponsored Nice Ride Minnesota in Minneapolis with $1.75M and has offered up to a $1.5M match for expansion of the service. For bike-sharing implementers, private engagement can expand a service in a cost-efficient way -- creating a win-win for both parties. 5) Don’t do it alone, work regionally. Bike-sharing can produce the greatest benefits when done regionally, which is why the Paris and Washington, DC areas have regional services. For commuting trips, bike-sharing is ideal for the first-mile/last-mile challenge of getting folks to and from longer haul transit services. Implementing a service takes a lot of work, but sharing the workload, and expenses, among multiple jurisdictions helps a great deal. Additionally, it’s important that jurisdictions within a region have the same, compatible service, so riding from one jurisdiction to another is smooth and makes for a pleasant customer experience. With the number of bike-sharing services in the U.S. and worldwide rapidly increasing each year, bike-sharing has proven effective at serving the public well for short urban trips as well as complementing other modes of transit. However, like any other transit mode, there are pitfalls both shared with other transit modes and unique to bike-sharing which should be avoided to ensure a successful and well-used service. Following this advice will get your jurisdiction rolling in the right direction. Paul DeMaio is the founder of the bike-sharing consultancy MetroBike, LLC and co-author of The Bike-sharing Blog. This article was originally published in Shareable. 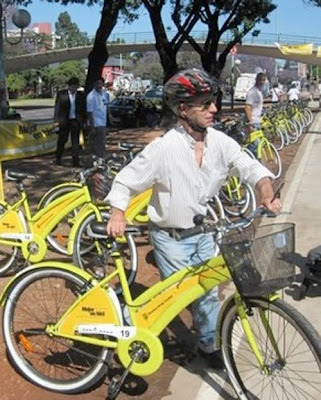 Buenos Aires, Argentina has joined the world of bike-sharing with a staffed 2nd generation system. The city’s bicycle program, "Mejor en Bici", released 100 bikes onto the streets of Buenos Aires this past December 1st. The human-powered pilot program has grown to employ a fleet of 500 ‘bicis’, which users can pick up at any of the 12 hubs after signing up with the attendant, and drop it off at any other hub during the hours of operation. The hubs are open from 8am – 10pm during the week and 9 – 3 on the weekends. To help support the service, Mejor en Bici and the Institute for Transportation and Development Policy are developing a network of 60 miles of cycle tracks, almost half of which is already complete. The city hopes to eventually expand to a fully automated 5,000-bike program, putting it on par with some of the world’s largest 3rd generation services. Editor's note: Mexico City also had its own "Mejor en Bici" service with three locations in 2008, which grew into what is now EcoBici.